Bernard Haitink, Royal Concertgebouw Orchestra. Newton Classics 8802054. It wasn't long after German conductor and composer Richard Strauss (1864-1949) premiered An Alpine Symphony in 1915 that critics began lambasting it as frivolous cotton-candy: picture-postcard music unworthy of the man's talents. That always seemed to me an unfair assessment. It appears that people couldn't help comparing the new work to Strauss's previous tone poems, like Don Juan, Tod und Verklärung (Death and Transfiguration), Till Eulenspiegels lustige Streiche (Till Eulenspiegel's Merry Pranks), Also sprach Zarathustra (Thus Spake Zarathustra), Don Quixote, and Ein Heldenleben (A Hero's Life), which combined a degree of philosophical insight with the purely pictorial nature of the music. These folks thought the Alpine Symphony just didn't live up because it merely told a story. I wonder if they thought of lodging the same complaint against Beethoven's Pastoral Symphony. In any case, it wasn't until the latter part of the twentieth century that the Alpine Symphony got its proper due as more and more-important conductors took up the baton in its defense. The first of the influential ones was Rudolf Kempe's second recording of the piece for EMI in 1971, Kempe conducting the very orchestra for whom Strauss originally dedicated the score, the Dresden Staatskapelle. It remains the recording to which we must compare all others. After Kempe came recordings from Georg Solti, Herbert von Karajan (the first digital pressing), Herbert Blomstedt, Andre Previn, Edo de Waart, Zubin Mehta, Daniel Barenboim, Seiji Ozawa, Lorin Maazel, Vladimir Ashkenazy, Giuseppe Sinopoli, Christian Thielemann, David Zinman, Gerard Schwarz, Andrew Litton, Franz Welser-Möst, Antoni Wit, Marin Alsop, and Marek Janowski among many others. These conductors lent the work prestige and helped it gain public acceptance. 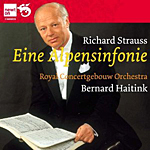 In 1985, Bernard Haitink recorded it for Philips in the present recording, reissued by Newton Classics. (Haitink re-recorded it live with the London Symphony Orchestra in 2008, but we'll leave that for another time.) It was this mid-Eighties recording that helped reinforce the notion that the Alpine Symphony might not be purely empty-headed fluff after all. Nevertheless, when Philips issued a set of "Great Strauss Tone Poems" in 1994, they omitted the Symphony. Of course, the Alpine Symphony is not really a symphony at all, at least not a symphony in the conventional sense. It's a series of twenty-two interconnected passages, or movements, that tell the story of an alpine climb, with chapter titles telling the tale, things like "Night," "Sunrise," "The Ascent," "Entry into the Forest," "Wandering by the Brook," "By the Waterfall," "On Flowering Meadows," "An Alpine Pasture," "On the Glacier," "Dangerous Moments," "On the Summit," "Calm Before the Storm," "Thunderstorm," "Sunset," and a return to "Night." Strauss describes each of these events in music, and although there may be a few too many climaxes along the way, it is all quite graphic and imposing. Strauss calls for a huge orchestra, over 120 players, and the piece is vast in scope, elaborate, often majestic, and not a little bombastic. Indeed, the work started out as something else entirely and kind of evolved into what it finally became. Early on, Strauss wrote "I will call my Alpine Symphony the Antichrist, because in it there is moral purification by means of one's own strength, liberation through work, worship of glorious, eternal nature." Later, he said it was simply the musical reflection of a childhood mountain-climbing expedition. Be that as it may, whether you consider the Alpine Symphony in a purely metaphorical or literal sense seems to me beside the point; to enjoy it is the goal. Anyway, Haitink's interpretation has weight, authority, and grandeur in spades. He makes it more than just pictorial, although it is certainly that; it is music for music's sake on a lofty scale. Haitink never glamorizes the work or sentimentalizes it. As Haitink does in his Mahler readings (and the comparison is apt because Strauss greatly admired Gustav Mahler, using certain forms and themes from Mahler's Sixth and Seventh Symphonies in the Alpine Symphony), he plays the score as straightforwardly as possible and lets the music take care of itself. Most important, the conductor never approaches the work as a series of disconnected ideas but a unified, structural whole. As a result, he brings each scene vividly to life and allows the Alpine Symphony to shine forth more majestically than ever. This is, indeed, one of the great performances of a sometimes underestimated work. Philips recorded the performance digitally in the Concertgebouw in 1985, and as it is no longer in the Philips catalogue, Newton Classics thankfully reissued it in 2011. Although the engineers originally made it with digital processing, there is an odd, faint background noise, almost like a low-level tape hiss, audible during quieter passages, especially at the beginning and the end of the piece. That said, almost everything else is fairly good about the sound. Typically from this source, there is a big, spacious hall ambience, yet one that never interferes too seriously with the overall clarity of the sonics. It's true there is a somewhat fat upper bass and a degree of resonance that slightly veils the midrange; however, if anything the acoustic reinforces the immense size of the music, the orchestra spread broadly across the sound stage even beyond the speakers, as large-scale as the Alps themselves. There is pretty good orchestral depth, too, with strong dynamics, a wide frequency response, and a vigorous impact. In short, it's a decent recording, if not really in the demonstration class or quite up to the sound of the Concertgebouw in the analogue Seventies.